This very nice Faberge style egg pendant is hand-crafted by Russian artist. The size of this pendant is 1 x 0.5". 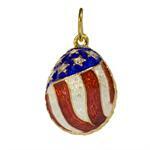 This egg pendant is made of sterling silver, enamel, 22kt gold over silver, and Swarovski crystals. It comes in assorted colors of enamel.